When it comes to paving, Councils and Homeowners are looking for form and function. Foremost, public spaces need to be safe, then functional, cost effective, then beautiful. For example, Tree Surrounds in highly trafficked areas need to pose no safety/trip hazard, they must allow water to reach tree roots and they must affordable to install in larger numbers. Increasingly, these public areas should be decorative. Places like Manly Corso, Sydney Airport, Docklands Stadium. These areas have heritage and aesthetic values that need to be up held. Similarly private driveways need to withstand repeated wear, UV, be safe in the wet but also compliment the appearance of a new home. StoneSet is also available in many colours and mixtures, which can be used for custom groundcover and pavement designs in hardscaping features for your clients. Patterns are achieved using stenils and aluminium edgeing. 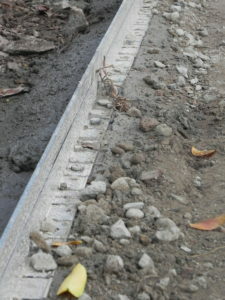 One example of how we create a hard edge using the landscaping product link edge which is a popular choice for securing a hard edge over a porous road base. 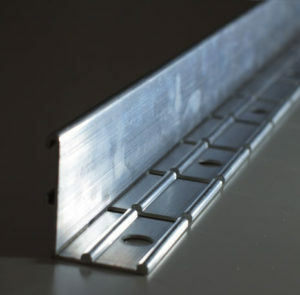 When nailing this at multiple points into a cement base or 150mm of compacted road base, this provides sufficient strength and a barrier for the StoneSet. 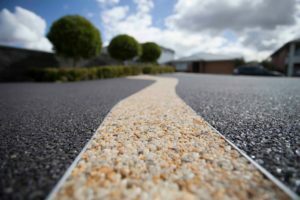 Once StoneSet resin has dried, the adhesion between the stones and the link edge along the entire length is sufficient integrity to the edge of the driveway, particularly given the vertical aluminium outside edge protection. 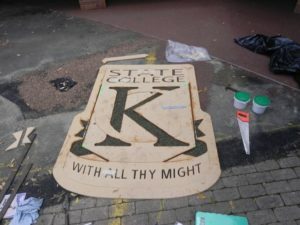 Below is an example of a logo stencil that had been machined from MDF and used to guide the stone into position. Scroll through the gallery below of more than 20 decorative and permeable paving installations we’ve done over the last 10 years. Click the photo of each job to see a range of photos which will demonstrate the decorative process involved in each installation. Because as a permeable paving company we are also a creative paving company!